On first hearing about this book that dealt with homeopathy, intensive care and emergency medicine, I was impressed, intrigued and keen to read it. Most people have the impression that homeopathy is only for slow conditions;, that one needs time to get results, etc. Our literature does talk about quick results in life-threatening conditions, but those are few and far between. 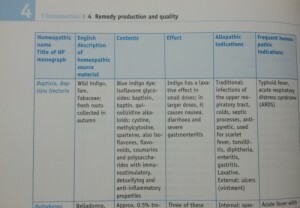 To have a whole book dedicated to the use of homeopathy in such situations is a marvellous thing indeed. So when I was offered a chance to review this book, of course, I jumped at it. Let me first talk a bit about the authors of the book. Both the editors of this book, Michael Frass and Martin Bündner have long-standing experience in emergency medicine and homeopathy. Michael Frass was head of the intensive internal medicine unit at the Medical University of Vienna and Martin Bündner has served in rescue and emergency medicine. A total of 19 physicians have contributed their cases for compiling this book; a vast majority of cases are by Michael Frass and Martin Bündner. 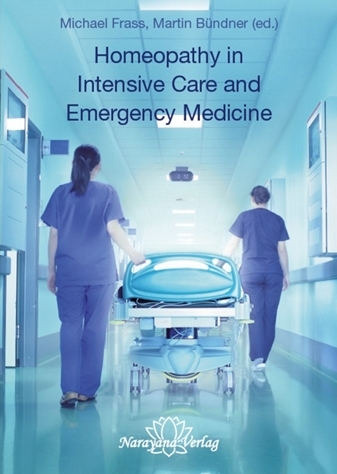 The next section, on Intensive Care Medicine, has chapters on Infectious diseases, Disorders of Haemostasis, Heart, circulation and blood vessels, Lungs, Kidneys, Gastrointestinal tract, Perioperative care and Toxicology. 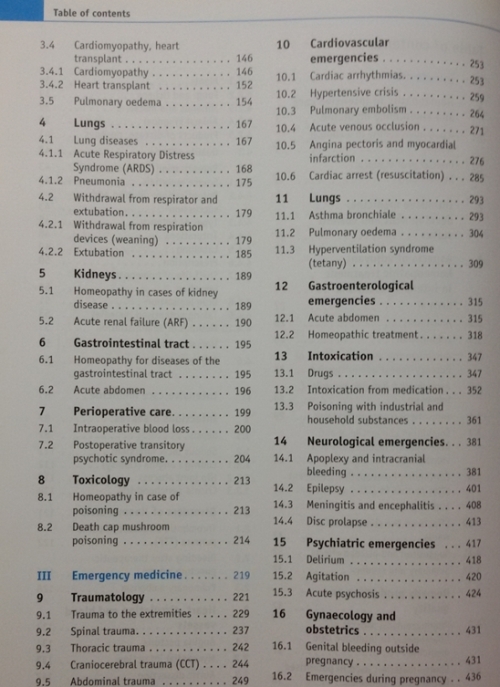 The third section on Emergency Medicine has chapters on Traumatology, Cardiovascular emergencies, Lungs, Gastroenterological emergencies, Intoxication, Neurological emergencies, Psychiatric emergencies, Gynaecology and obstetrics, Urological emergencies and Thermal emergencies. 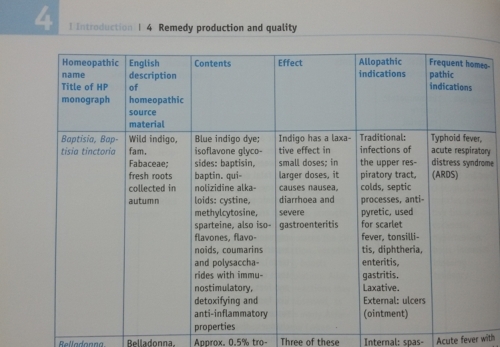 The last section has a Materia Medica which gives a brief idea of the clinical indications, general information with main symptoms, ameliorating and aggravating circumstances which play an important role in the selection of the right homeopathic remedy. The book has a total of 145 cases, all of them with a detailed analysis. 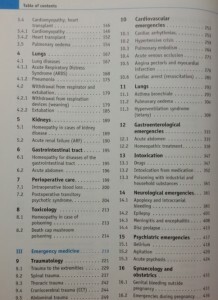 To give an idea of the type of cases covered, here is a picture from the Table of contents. Each topic starts with a quick overview of the definition of the clinical entity, incidence, mortality, symptoms, latest diagnostic methods, imaging techniques, blood cultures, therapy and the general outline of the homeopathic treatment, giving details of randomised, double-blind, placebo-controlled studies which have been made in an intensive care unit. Important rubrics from the repertory have been given and a differentiation between important homeopathic remedies given. This is followed by a critical commentary. Cases then follow, starting with the anamnesis, the acute event, diagnosis, conventional treatment given and then the homeopathic treatment with rubric selection and progress of the case. Principles of classical homeopathy have been followed in most cases. This is again followed by an evaluation and a critical commentary. The cases have been described in a clear and concise manner, highlighting the role of homeopathy in a situation where in many cases, conventional treatment was trying its best but the patient response was minimal. Most of the cases show remarkable and clear improvement in the patient’s condition after the homeopathic treatment was started. Some surgeries have been avoided and danger to life averted. Homeopathy has helped patients get weaned off life-support systems much earlier than otherwise possible. The authors have discussed the difficulties of homeopathic treatment in an ICU set-up and the benefits of initial conventional life-saving and life-support methods. It is clear that the authors and editors have been balanced in their view point and there is no display of dangerous fanaticism. This book shows how valuable our gentle but high-energy remedies can be in emergency situations in an ICU set-up. It would be wonderful if all ICUs would have the possibility of integrating homeopathy along with conventional medicine. After all, to benefit our patients; that isthe goal of any system of therapeutics, is to benefit the patients. Reading this book will give hope and encouragement to young homeopaths that with hard work, acquiring knowledge of the Materia Medica and skill with the Repertory, even cases that look ‘difficult’ are manageable with our wonderful system of medicine, Homeopathy! No review of mine is complete without a mention of the binding, paper quality, printing, etc. This book gets 9 on 10 in this department, simply because there are a couple of pages where some paragraphs have been wrongly repeated! Apart from that, wonderful smooth paper, good hardcover, excellent binding, good printing! No complaints. It was a pleasure to read this book. I think this book will encourage more homeopaths to venture into this arena of Intensive Care and Emergency Medicine. Posted by Dr. Firuzi Mehta on Tuesday, 10th January 2017 at 10:20 pm under Articles.